Born on 5 February 1889 in Kirby Muxloe, Leicester, England - son of Henry S. and Florence M.E. Partridge, Oadby, Leicester, England - at the time of his enlistment in 1915: trade as laborer; single; no current or previous military service; Church of England; height of 5 feet 8.5 inches; chest of 36 inches fully expanded; brown eyes; light brown hair. 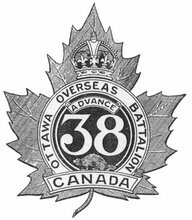 Joined the 59th Battalion, CEF, in Ottawa, Ontario, on 21 May 1915 - transferred to the 38th Battalion, CEF, on 22 June 1915 (number 410849) - served with the 38th Battalion during its period of garrison duty in Bermuda - landed in France with the 38th Battalion on 13 August 1916 - wounded on 20 October 1916 - rejoined the 38th Battalion on 6 November 1916 - wounded on 22 February 1917 - died of those wounds on 23 February 1917 - buried in Villers Station Cemetery (grave VII.C.12), France.